Anna’s Tyler McClay stops a short hit during a Shelby County Athletic League game against Fort Loramie on Thursday at Anna. 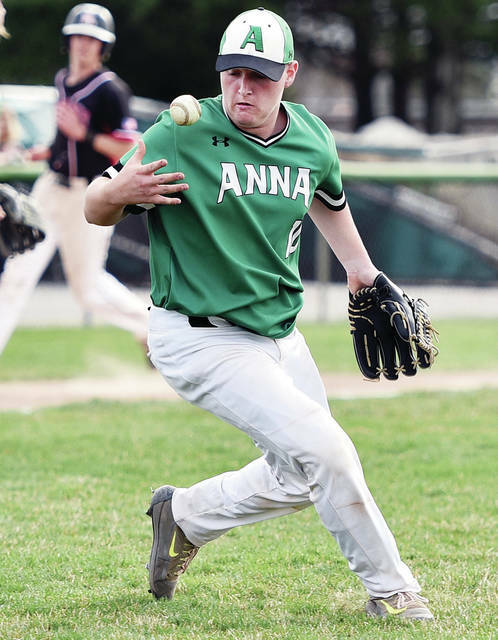 Anna’s Andrew Scully waits for the ball during a pick-off attempt of Fort Loramie’s Darren Hoying during a Shelby County Athletic League game on Thursday at Anna. Fort Loramie's Shane Hilgefort prepares to throw to first as Anna's Carter Elliott runs past towards second during a Shelby County Athletic League game on Thursday at Anna. 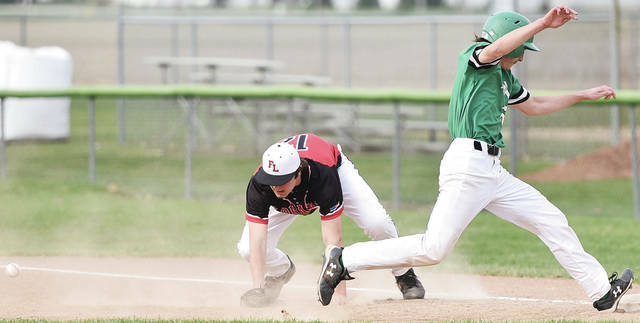 Fort Loramie’s Nathan Raterman hits a ground ball during a Shelby County Athletic League game on Thursday at Anna. Raterman was 2 for 3 with 2 RBIs and three runs. Fort Loramie's Jared Middendorf runs from first to second as the ball rolls past Anna's Jarred Seigle during a Shelby County Athletic League game on Thursday at Anna. 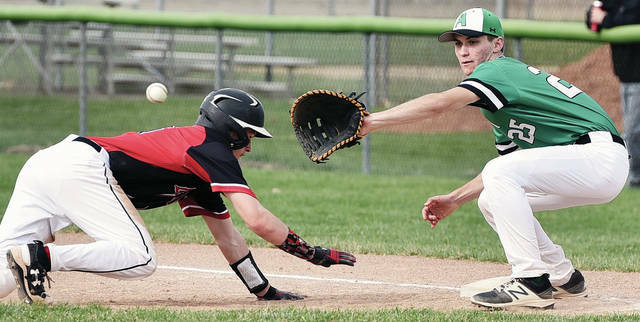 Fort Loramie's Nathan Ratermann has the ball go past on a pick-off attempt as Anna's Brandon Shannon jumps back on first during a Shelby County Athletic League game on Thursday at Anna. 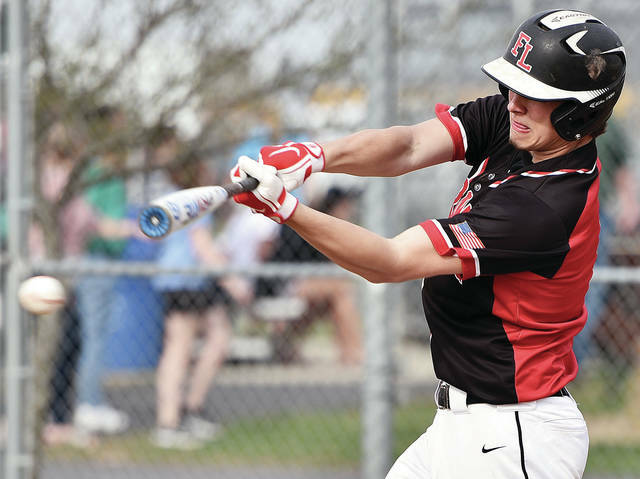 ANNA — A showdown between the Shelby County Athletic League’s last two undefeated squads ended up being like most of the other conference games Fort Loramie has played in: a one-sided hitting display. Fort Loramie consistently hit against the four pitchers Anna sent to the mound and quickly ran away in a 23-0 victory in five innings on Thursday in Anna. The Redskins racked up 16 hits, five of which were extra-base blasts. The Rockets gave up five walks, hit four batters and committed four errors. Fort Loramie senior left-handed pitcher Jared Middendorf had another good start. In four innings, he gave up four hits and had six strikeouts with two walks. It’s the first victory Middendorf has had against Anna in his career. “I sort of contemplated not throwing him today,” Fort Loramie coach Jeff Sanders said. “I was thinking about matchups, and thought maybe we would try to change it and go with someone else. We talked amongst the coaches and threw some ideas around, and it turned out that Jared’s our guy. The Redskins, which are the defending Division IV state champions, improve to 10-0 overall and 5-0 in SCAL play. Except for a 2-0 win over Russia on March 28, all of the team’s SCAL wins have been by run-rule margins. It’s far and away the worst loss of the season for Anna (7-2, 5-1). The Rockets’ only other loss was a 7-6 defeat by New Bremen (7-1) on April 2. “Day in and day out in the Shelby County League, you don’t know how a game is going to unfold,” Sanders said. “When we played Russia, (Daniel) Kearns pitched a great game that day, and it was a close game the whole way. The Redskins scored one run in the first inning when CJ Billing hit an RBI double to left field. They broke open in the second with nine runs on six hits, two walks and one hit batter. Nathan Raterman hit a two-run single while Ben Barhorst and Darren Hoying each hit one-run singles to the outfield. Billing had a two-run double that rolled to the left-field fence in the inning. The Redskins added three runs on one hit and two walks in the third and scored five runs on five hits in the fourth. Billing started the scoring in the fourth with a three-run home run that landed about 10 feet behind the 335-foot sign in right field. Fort Loramie closed its scoring with five runs on three hits and one hit batter in the fifth. Joel Keiser was brought in to close things out in the bottom of the fifth and retired Anna in order. Billing was 3 for 3 at the plate with 6 RBIs and three runs. Sanders hopes it’s a breakout performance for the senior third baseman, who is only hitting about .285. Though Fort Loramie has scored at least 10 runs in six games, Sanders said the squad is still looking for more consistent hitting. “We’ve had big hits at the right times,” Sanders said. “I don’t know if our hitting is where we want it to be at, but the season is still early. We’re still fine-tuning some things. There’s a couple of hitters that we’re still working on some things in the cage, working on their mechanics and trying to get them tuned in a little bit. Barhorst was 4 for 4 for the Redskins with 4 RBIs and three runs. Hoying, Raterman and Eli Rosengarten each had two hits. Anna leadoff hitter Kyle Evans was 2 for 3. The Rockets’ best chance at scoring came in the second. They had two men on with one out when Brayden Collier struck out swinging after a long plate appearance. Middendorf then walked Andrew Scully to load the bases but struck out Cole Maurer to end the inning. Anna left two batters on base in the third. Carter Elliott was charged for the loss for Anna. He gave up five earned runs on five hits and a walk in 1 1/3 innings. The squads will play again in SCAL play when Anna travels to Fort Loramie on May 6. Thursday was the start of a tough three-day stretch for the Redskins. They host New Bremen on Friday and then play Versailles (6-2) and Troy Christian (5-0) in the Zac Richard Classic on Saturday in Versailles. The Rockets had won their four previous games before Thursday, with each coming with at least seven-run margins. They return to action on Friday in Anna against Minster (6-2). Fort Loramie’s Shane Hilgefort prepares to throw to first as Anna’s Carter Elliott runs past towards second during a Shelby County Athletic League game on Thursday at Anna. 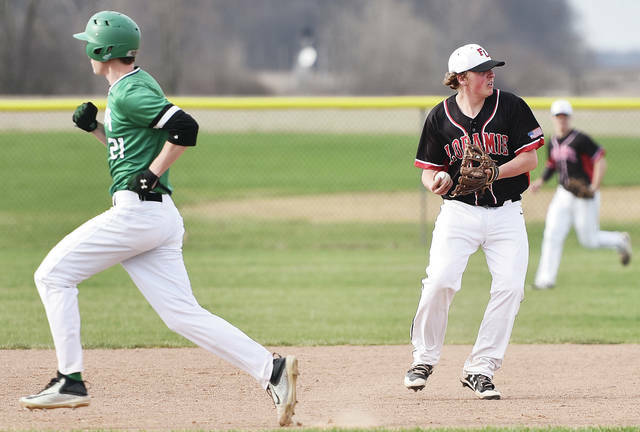 Fort Loramie’s Jared Middendorf runs from first to second as the ball rolls past Anna’s Jarred Seigle during a Shelby County Athletic League game on Thursday at Anna. 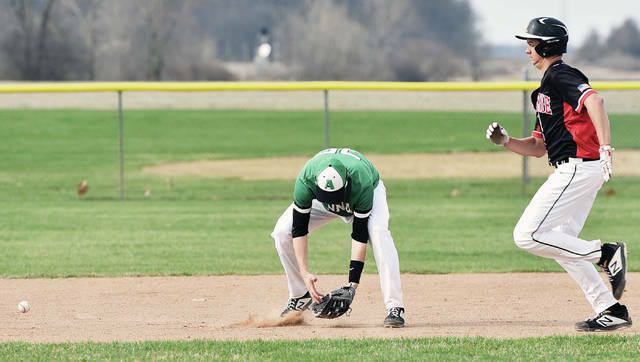 Fort Loramie’s Nathan Ratermann has the ball go past on a pick-off attempt as Anna’s Brandon Shannon jumps back on first during a Shelby County Athletic League game on Thursday at Anna. This entry was tagged Anna, Baseball, Carter Mescher, CJ Billing, Fort Loramie, high school, Jeff Sanders, Kristian Althauser, Nathan Raterman, Redskins, Rockets, SCAL, Shelby County Athletic League, Wil Luthman. Bookmark the permalink.